"Spidery" channels spotted near Mars' south pole by NASA's Mars Reconnaissance Orbiter. NASA's Mars Reconnaissance Orbiter (MRO) has been surveying strange "spider-like" surface features on Mars for years, and now citizen scientists are helping the orbiter hone in on areas that require further investigation. These prominent surface features are found near Mars' south pole, and are believed to be linked to seasonal changes. The planet's polar ice caps thaw bottom-side first in the spring, causing carbon dioxide to build up and carve deep channels in the terrain, according to a statement from NASA. 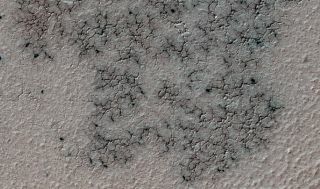 The Context Camera (CTX) aboard the MRO captured the images of these spider-like cracks and crevices, which volunteer citizen scientists have analyzed using the website "Planet Four: Terrains." With the observations from this citizen science project, NASA has added 20 new regions to the agency's seasonal monitoring campaign on Mars. The orbiter's High Resolution Imaging Science Experiment (HiRISE) camera will explore these regions in greater detail. "It's heartwarming to see so many citizens of planet Earth donate their time to help study Mars," Candice Hansen, HiRISE deputy principal investigator, said in the statement. "Thanks to the discovery power of so many people, we're using HiRISE to take images of places we might not have studied without this assistance." The new places of interest on Mars include some unexpected spider terrain, areas where the surface is composed of material that was ejected from impact craters. Previously, those areas were not associated with carbon dioxide ice sheets, and therefore not thought to have spider-like crevices. The spider cracks may have formed on the material ejected from craters using a different mechanism than the ice sheets, Hansen said. "Perhaps on surfaces that are more erodible, relative to other surfaces, slab ice would not need to be present as long, or [need to be] as thick, for spiders to form. We have new findings, and new questions to answer, thanks to all the help from volunteers," Hansen added.